I've been wanting to post this tutorial for YEARS now. 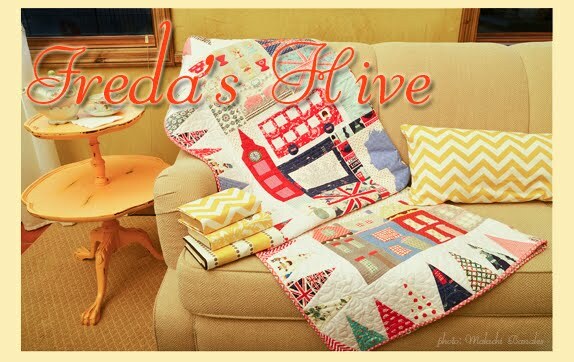 The quilt is called Freda's Beehive. 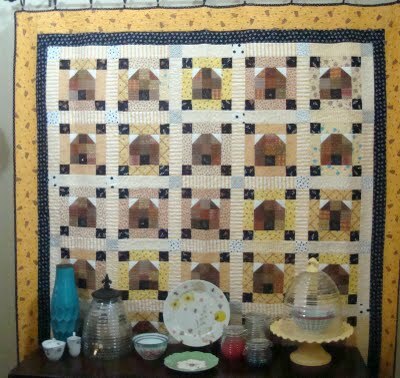 Several years ago I had a dream about making this quilt. I woke up in the middle of night, got out of bed and sketched this quilt block. 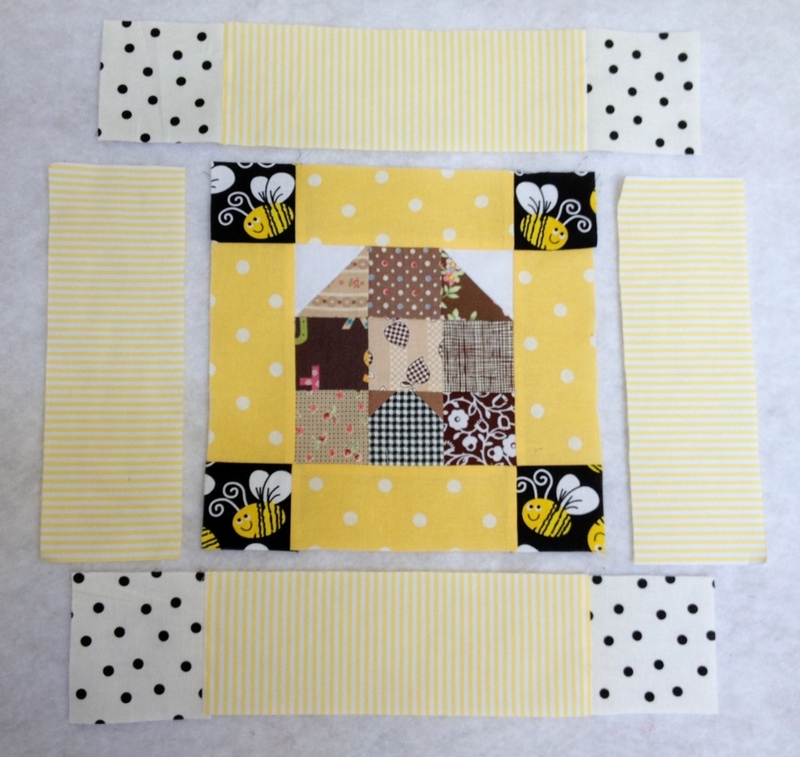 I am a simple quilter at heart and I love squares and patchwork so a patchwork beehive seemed perfect. 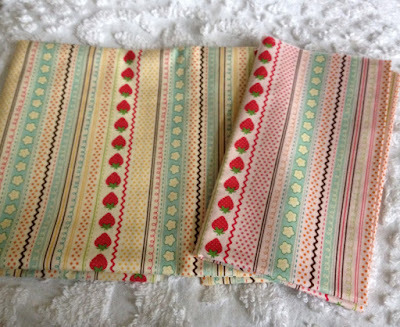 I made this quilt once for myself and then 3 more times for trades and a sale. 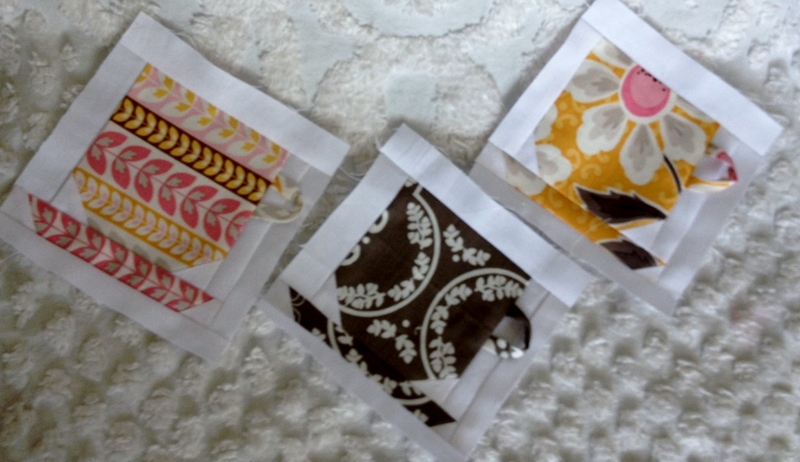 I've had requests for the pattern over the years and I've always intended to put the pattern together. But since I have so many supportive readers of my blog, I thought it would be good to offer the quilt idea/block as a tutorial. 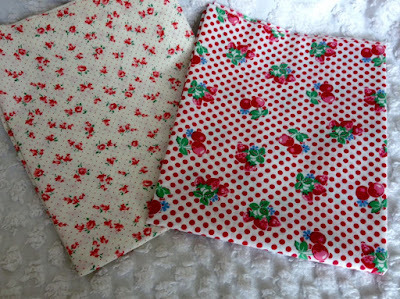 All seams are .25" and press as you go. 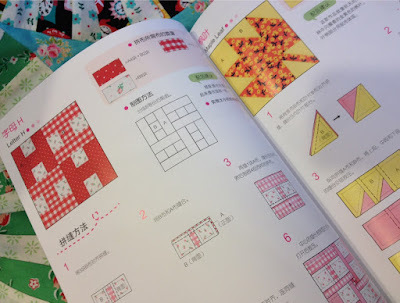 Read all instructions before cutting fabric. 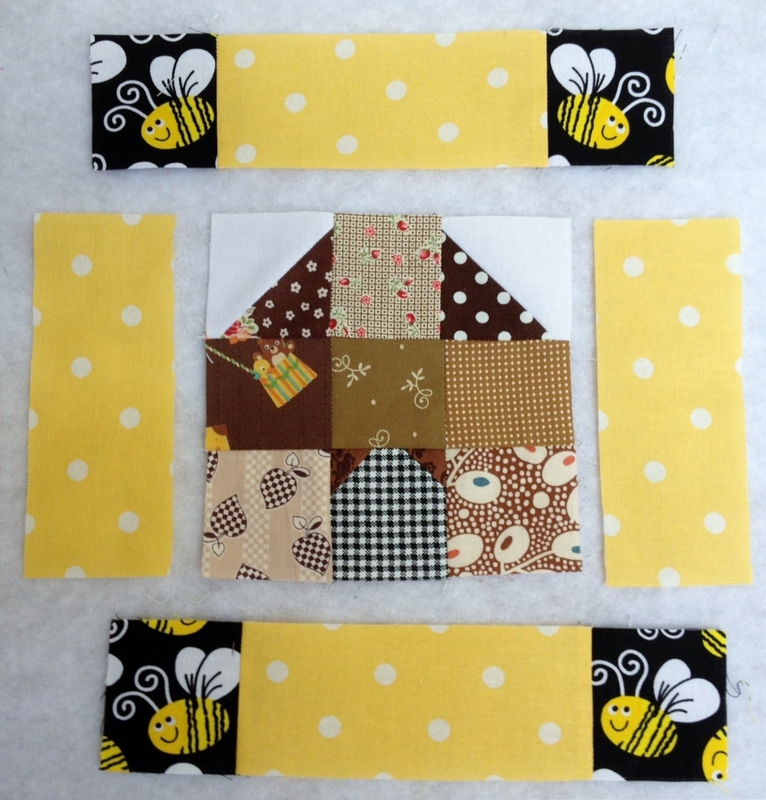 Following the block tutorial is a very simplified instruction for putting the quilt together. 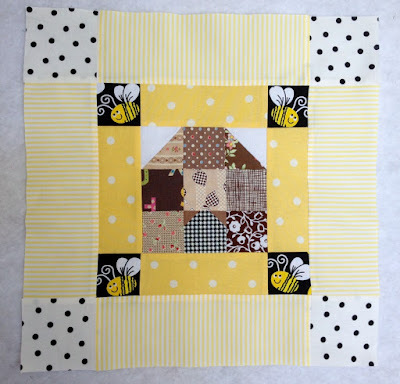 This is the basic beehive block. I'll go through the steps for making the block. 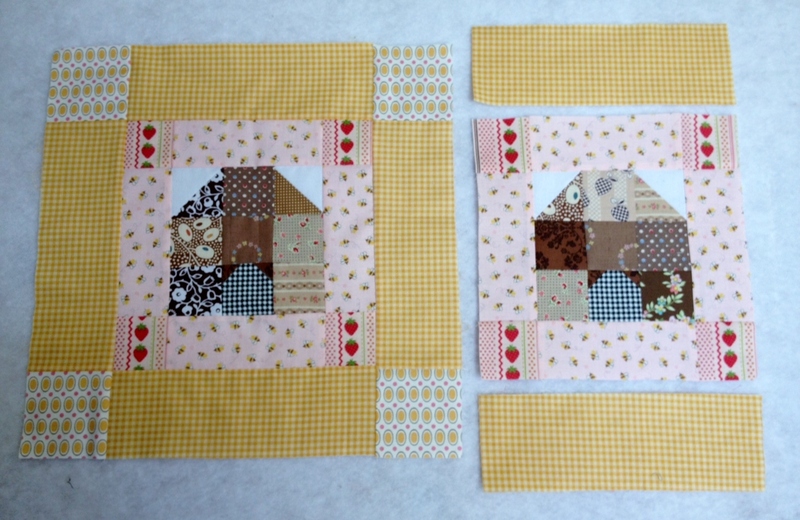 *This block is made with primary and secondary blocks. 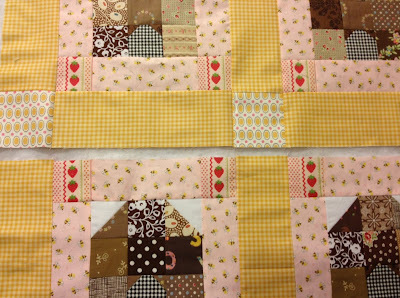 The secondary blocks need everything except only need 2) 3.5" x 10.5" outer sashing strips and do not need 3.5" outer squares dot fabric. 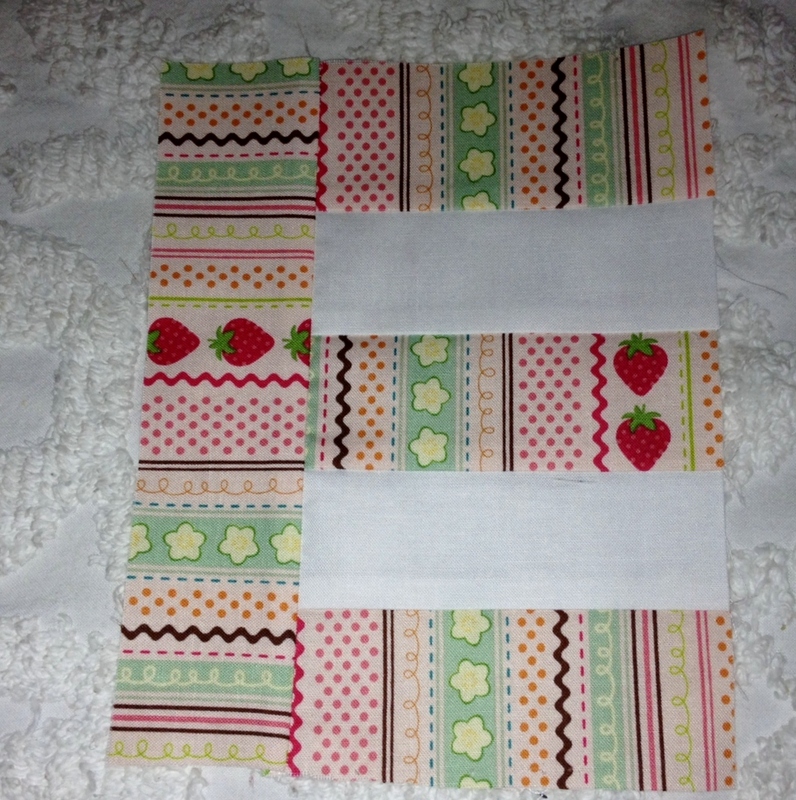 This is the same for the secondary row blocks. 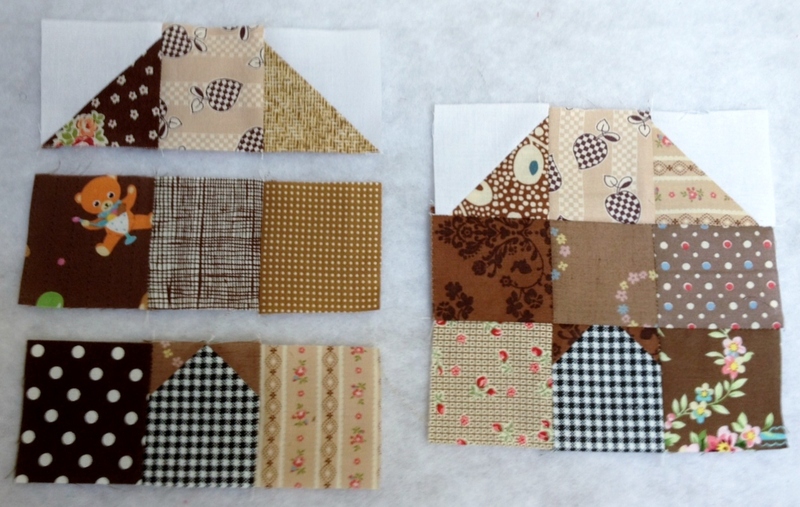 Match up both 2.5" white squares with two 2.5" squares from brown print. 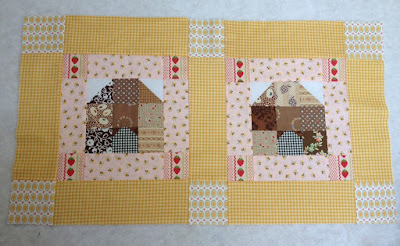 Stitch corner to corner diagonally. Trim seam allowance to .25". 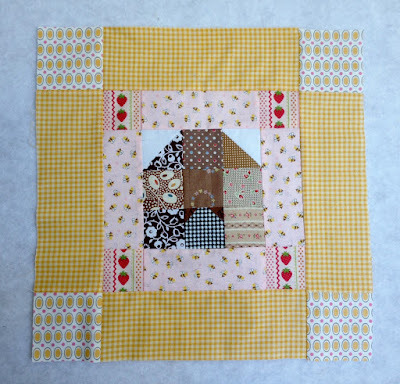 Open to make half square triangle block. 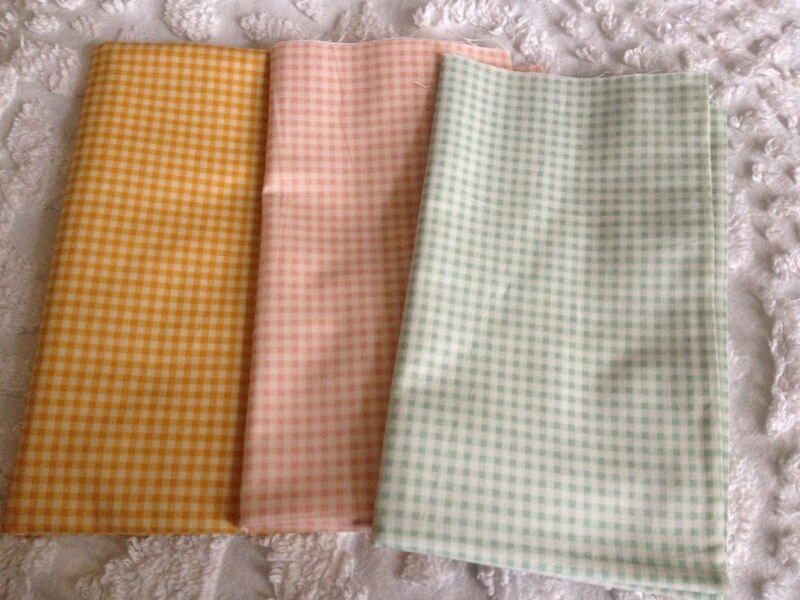 Place the 1.25" squares on either corner of the black gingham/dot fabric. 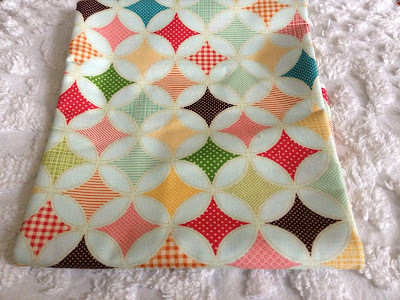 Stitch diagonally in the corners, trim seam and open. Make 3 rows with 3 squares in each row as above. 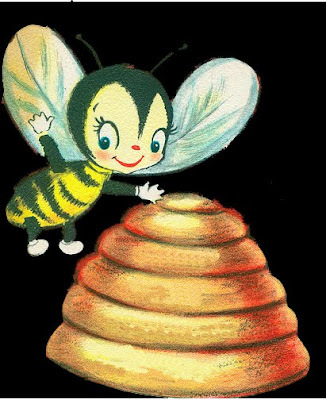 Join rows together to form beehive. Stitch 2 inner corner squares to either end of 2 inner sashing strips. 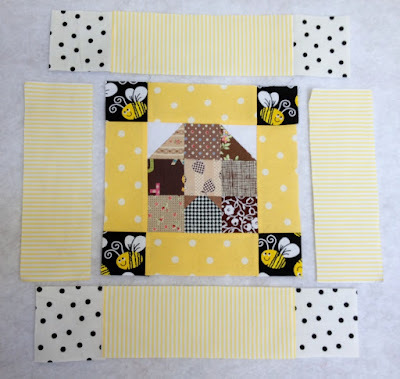 Stitch sashing strips to either side of the beehive and then stitch the joined corner sashing strips to bottom/top of beehive block. 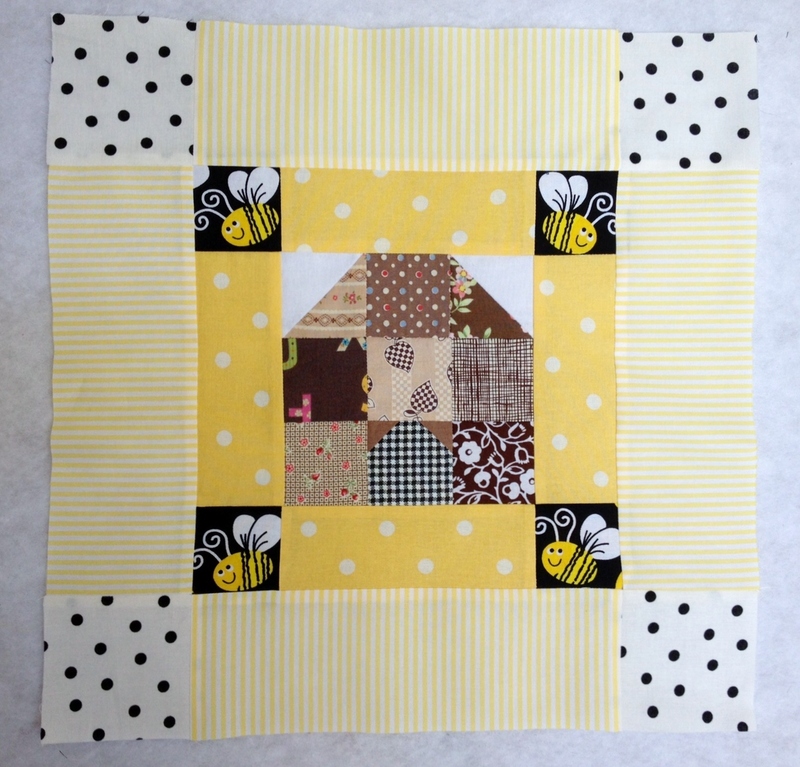 This would be a finished primary beehive block. 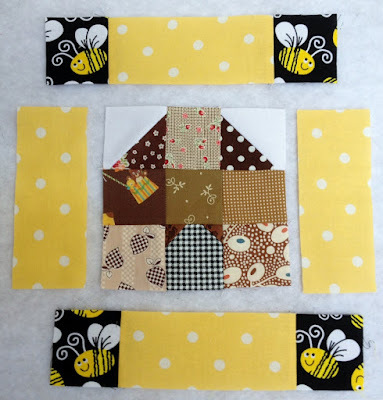 Create rows of beehives by starting with a primary block and then adding a secondary block. The secondary blocks have the outer sashing just on the top/bottom of the block. The next block in the row would be another primary block. Alternate primary and secondary blocks to create as long a row needed. There are also primary and secondary rows as well. 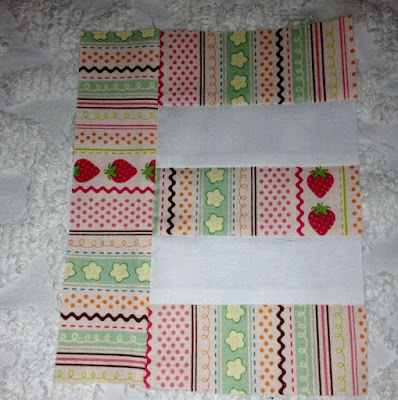 Secondary row sashing will be a 3.5" x 10.5" strip in between each block (and at the beginning of the secondary row) with no outer corner squares. 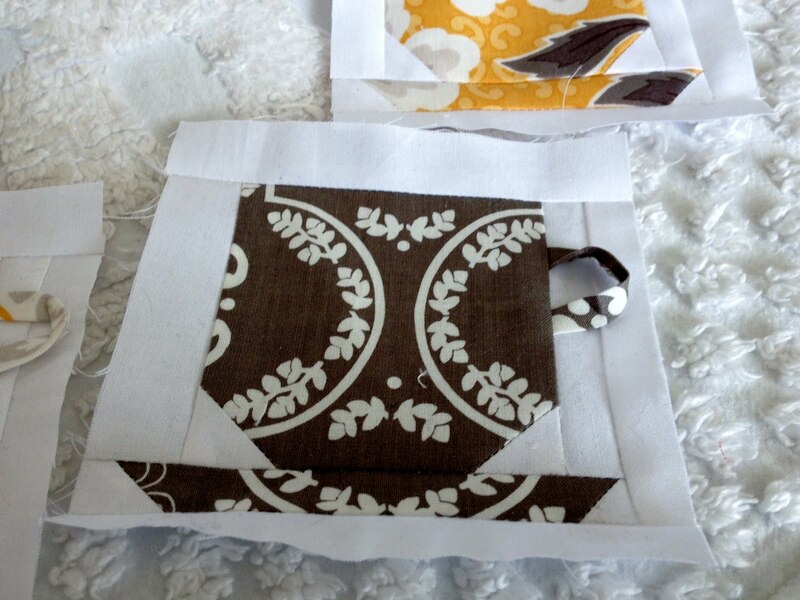 This is just a very easy quilt to make. 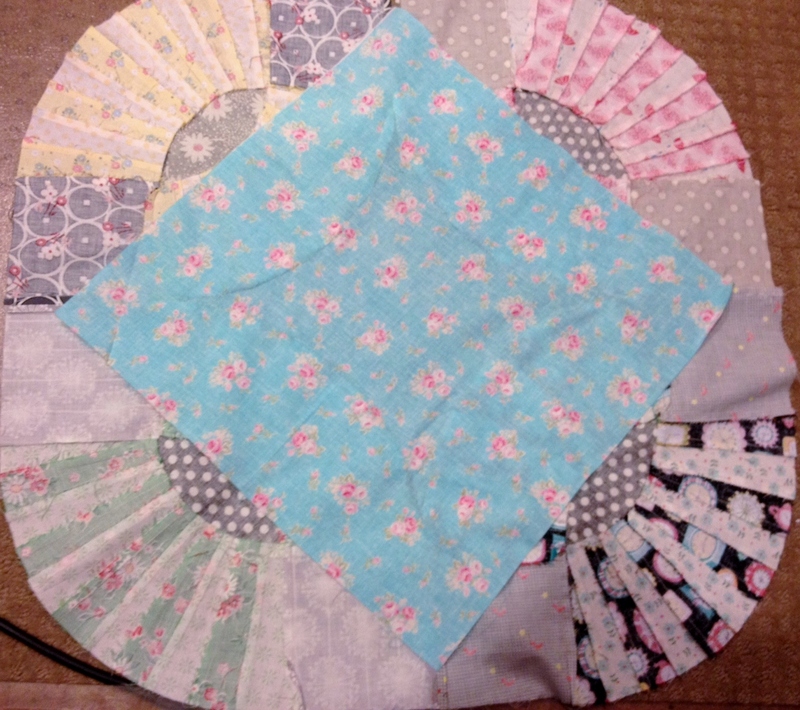 I've made a few minor adjustments since making my first version of the quilt. It would be a good exchange block or quilting bee block that any level of quilter could easily put together. I'm super busy this week so I won't post again until next week. If you have any questions or corrections, just email me. Thanks. Have a great week. Riley Blake has some great new fabrics out and I really like this new one called Fly a Kite. I mentioned this week I wanted to make an E quilt for Eliza. I'm a little late to the party considering she is 2 months old. But since she's still at Primary Regional Medical Center, it's okay. Poor baby. Yesterday she had surgery to place a G tube into her stomach for more direct and longer term feeding. The surgery went pretty well. We've had Allison at our house while my daughter is with Eliza. I just pray Eliza heals very fast so she can begin feedings soon. This piece from Fly a Kite really caught my eye. I really love the colors and the pattern. I knew when I saw it I would have to use it in a project. The companion prints are just darling. I like them all. I'm drawn to anything with strawberries. And the gingham's are really perfect for any project. 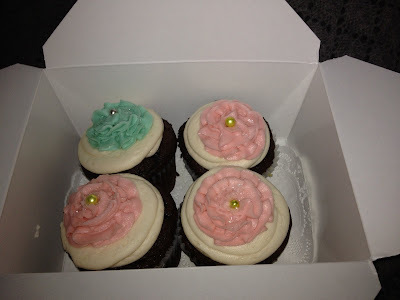 The colors of the fabric are like these pretty cupcakes. Which I may add, are delicious. My daughter Tracey was here from Oklahoma so we had to celebrate with cupcakes. Tracey is an identical twin to Whitney, Eliza and Allison's mom so Allison thinks she has 2 moms and it was really helpful that Tracey could spend the entire week helping Whitney with Allison. Thanks for all your sweet comments and emails about Eliza. Hopefully this change in how they feed her will help her grow. The doctors are very hesitant to predict progress but we really are hoping that by the first part of June she can come home. It has been a while since I posted some inspiring books. 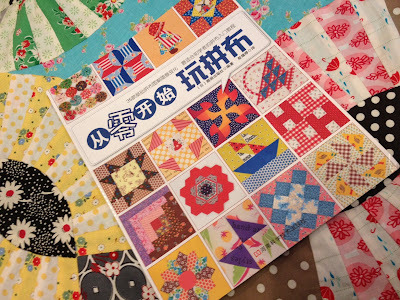 You know I love the vintage Japanese style of making blocks. So it's not surprising I'm always hunting down deals on Japanese quilting books. 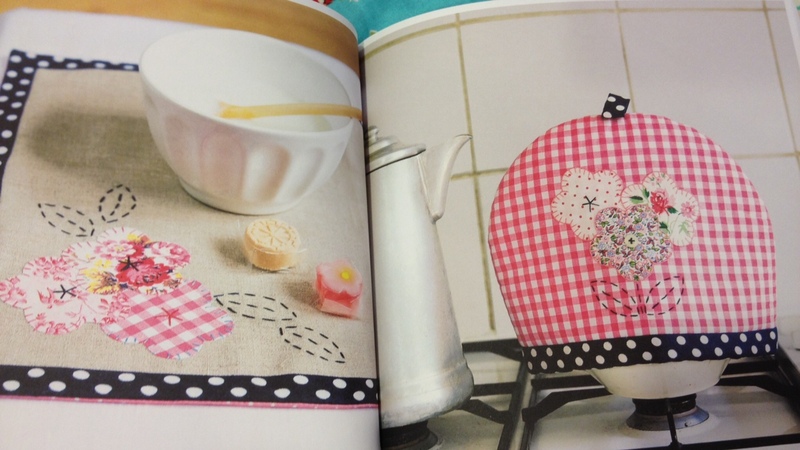 However, since all the Pinterest frenzy about not posting copywritten material, I'm hesitant to post about books. But here goes. 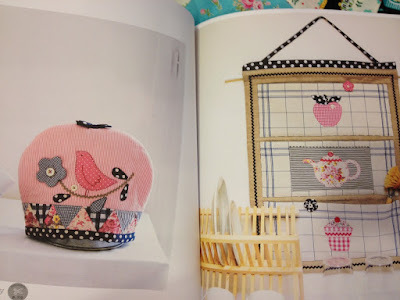 Even though this is a "beginner" style book I can still get inspiration from the colors, fabric and ideas found here. I like the H blocks. 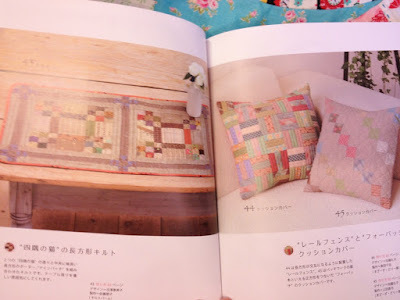 It gave me a good idea for Eliza's quilt. I think I'll do Es set like this. 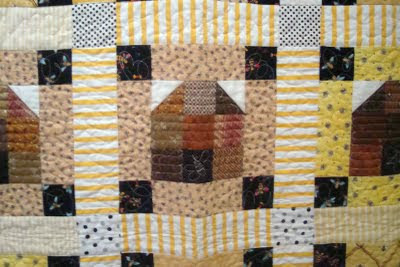 I made my daughter Laurie an L quilt and enjoyed the letter personalization. So I'm ready to make an E quilt for Eliza. 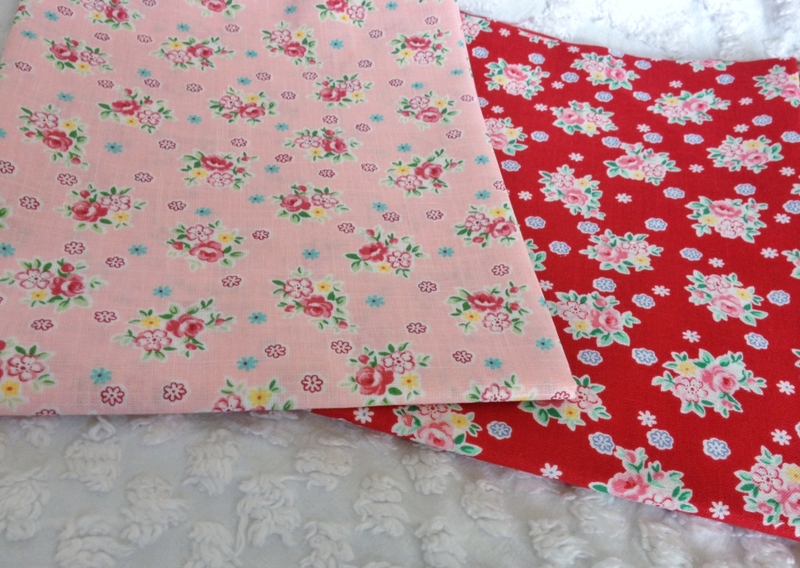 I even have fabric sitting out waiting to make it. But when will I get to it? Oy. 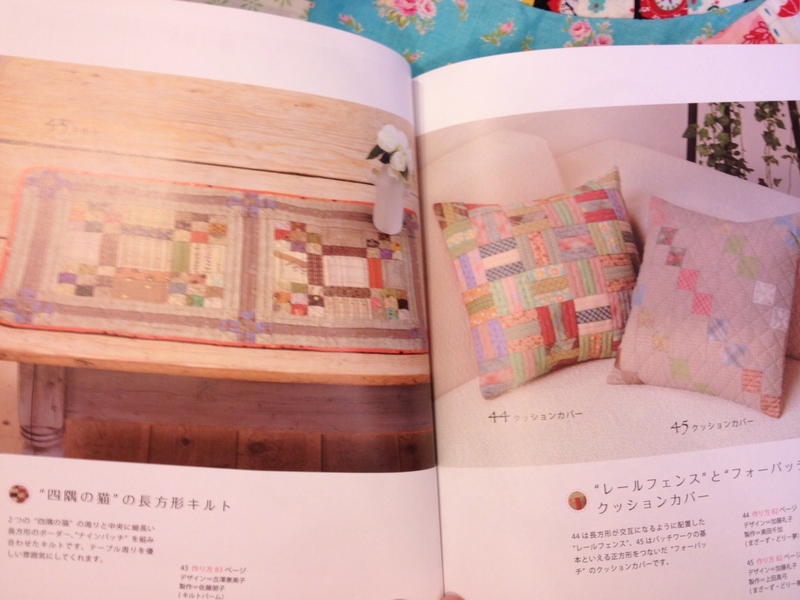 I like patchwork. I love squares and I'm always drawn to that simple style. 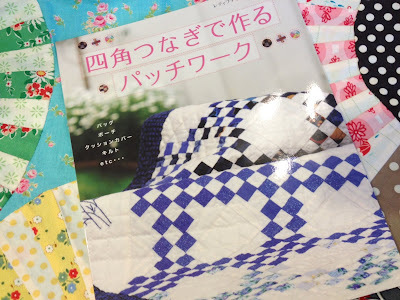 I like this 2 color blue and white patchwork on the cover of this book. 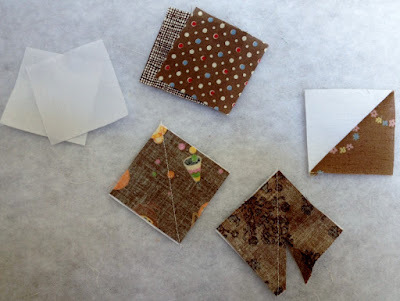 There is so much you can do with simple squares and rectangles. These ideas are so pretty. 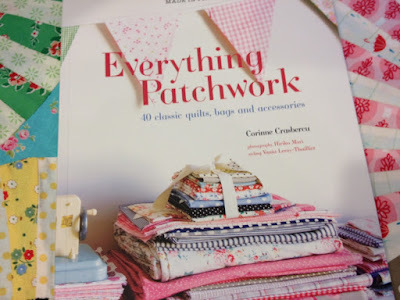 I've had this French "Everything Patchwork" book for a little while now. It is by Corinne Crasbercu. 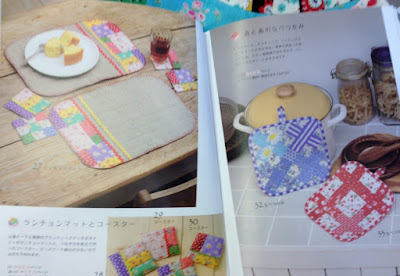 It is full of lovely fabric and photos of simple but beautiful projects. Again, patchwork pretty. Fabulous for scaling small or large projects. The little pansies are so pretty and would work in so many projects. I'm hoping to use this idea sometime in my quilting life. I think these pages are my favorites in this book. Birds, teapots, cupcakes and apples - I love them all. I've been wanting to make some mushrooms. I really love these with the rick rack bases. 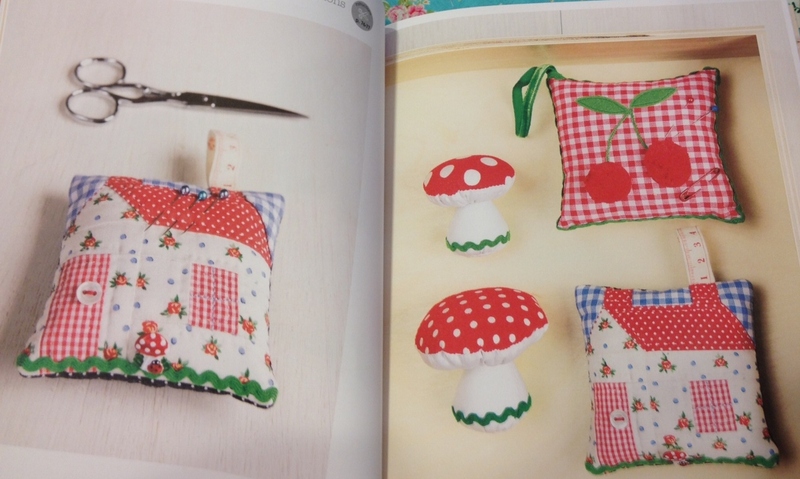 The houses and cherries are super cute, too. I only post books I can recommend. These qualify for picture book gazing. Progress is slow. At least for me. Lately I'm pretty pathetic with time management. Family over fabric, though. Right? I've only finished appliqueing 3 centers under groups of Gypsy Kisses eye pieces. 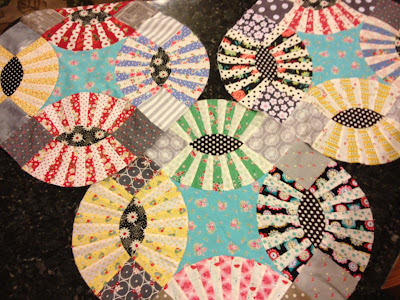 The good part is that it's rather easy and relatively quick to get the centers stitched into place. The bad part is I only completed 2 more over the weekend for the grand total of 3. Oh well. At least there's that. 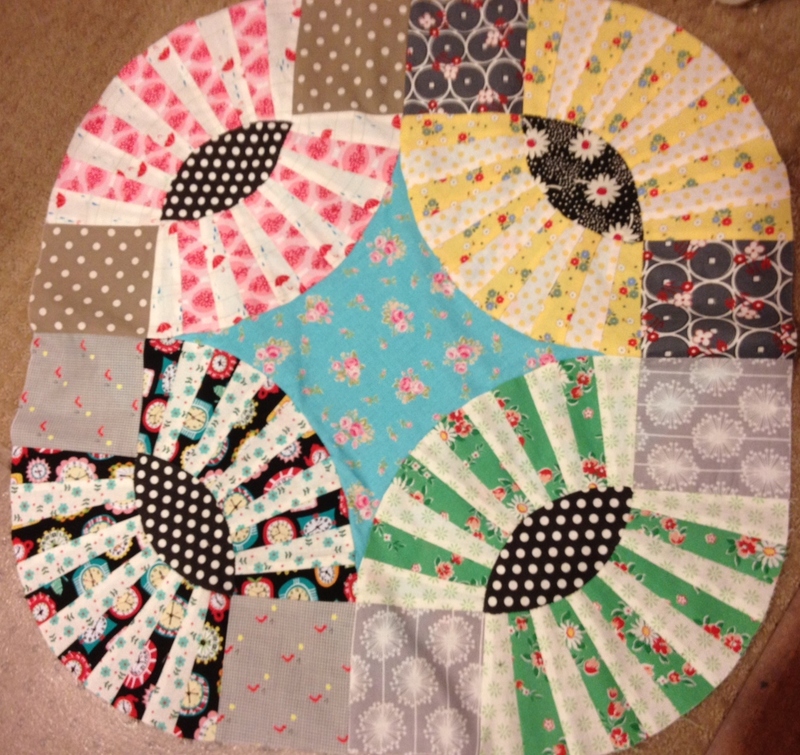 I decided to call each group of 4 eyes when joined with an appliqued center. a "blob", for lack of a better word. My biggest concern is when I have all my blobs completed, then I have to join the blobs into rows and applique that same center piece to connect several blobs. These blobs are just laid out on my counter and not connected. 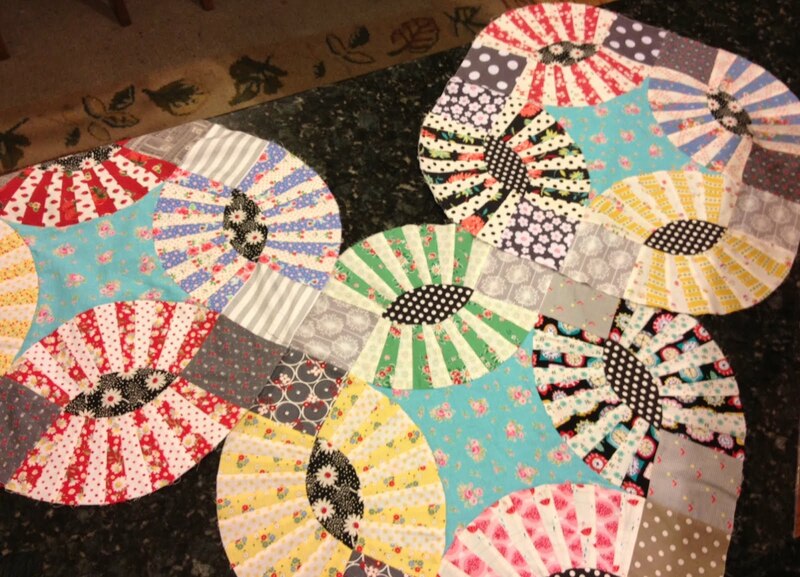 I can't even imagine laying all my completed blobs in one place to pin the applique part at this point. But one thing at a time. Right? I do like what I have so far. So I'll be satisfied with that today. 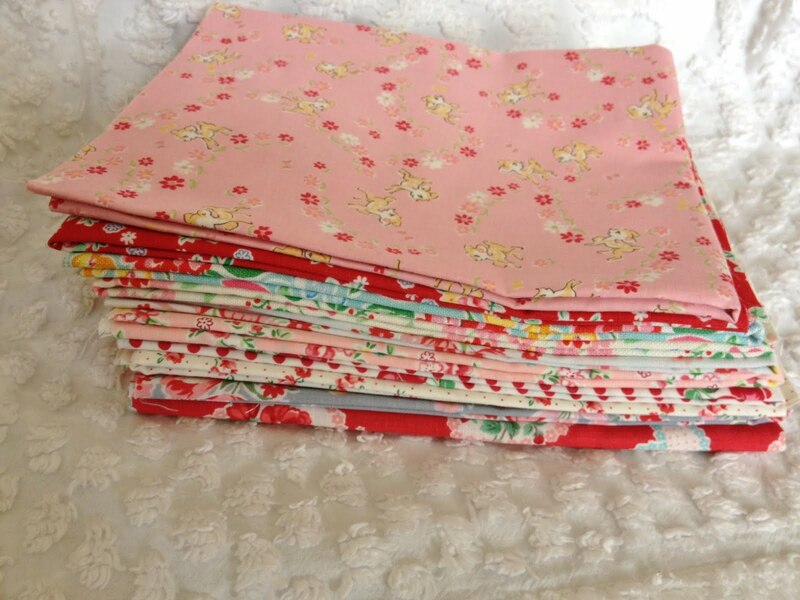 I think most of you can relate to my feelings of fabric making me "happy". 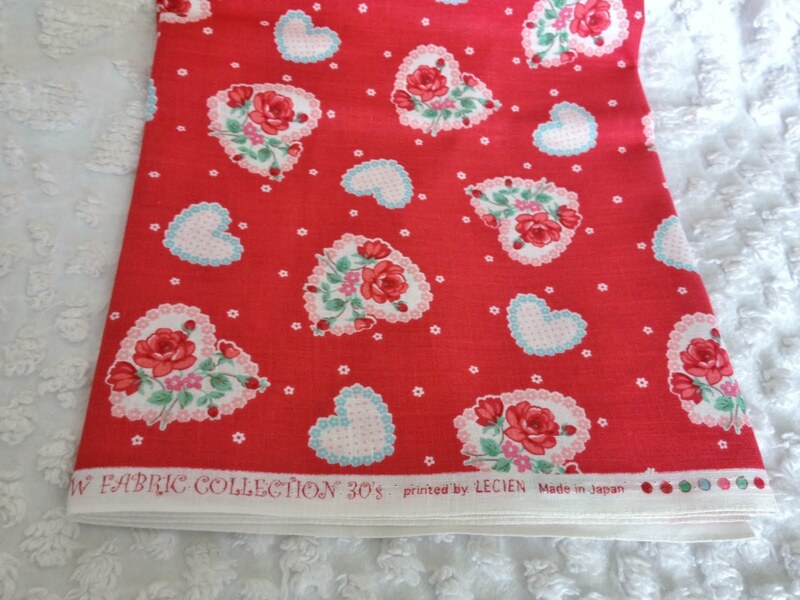 My love for fabric dates back to my childhood home where my mother, Freda, had fabric lined up on shelves and her sewing room was where we always found her. 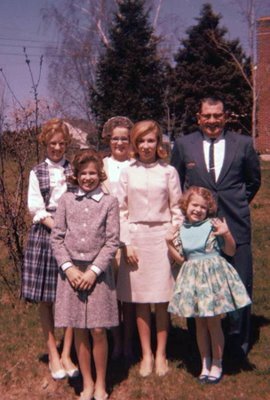 The older I get the more nostalgic I get about growing up in a working class city and in a home where I was happy. I want to show you some cuts from Lecien's 30's collection. 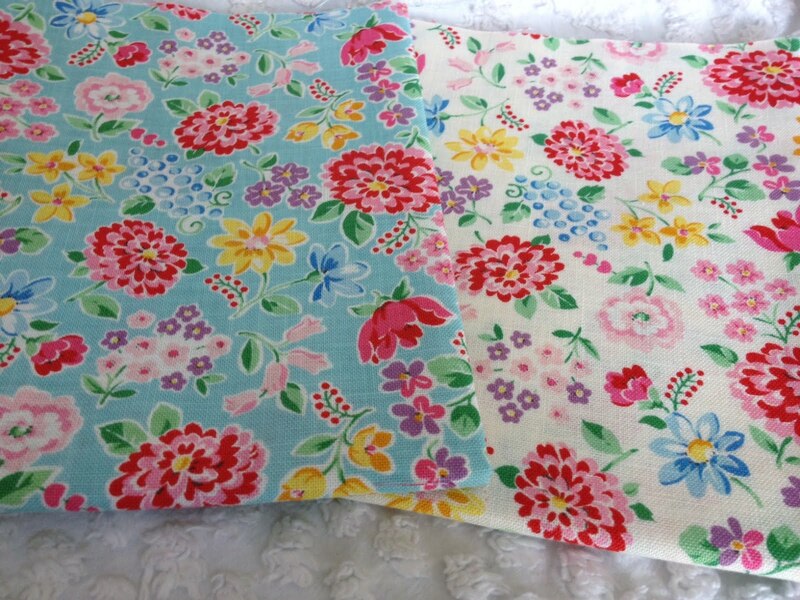 I have had (and used) some of these fabrics before and some of them are new to me. 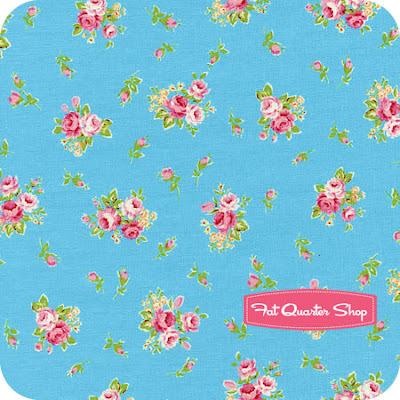 I love love this line of fabric. 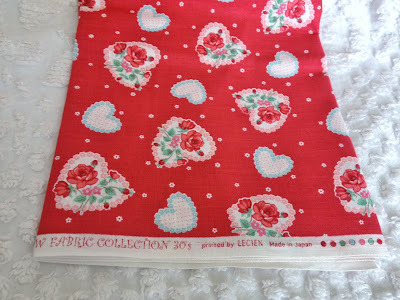 (I know, I've used up my allotment of the word love, now) Isn't this heart fabric super sweet? I was told years ago by someone that pink and red do not go together. Hmmph! What do they know? I love pink and red together. 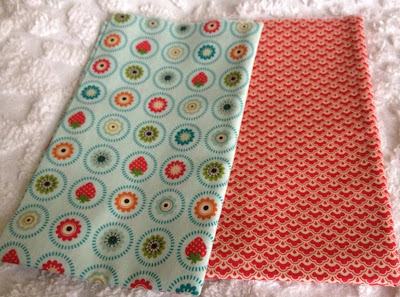 The dot with strawberries and cherries is a great fabric. And the little rosebud heart is just perfect. 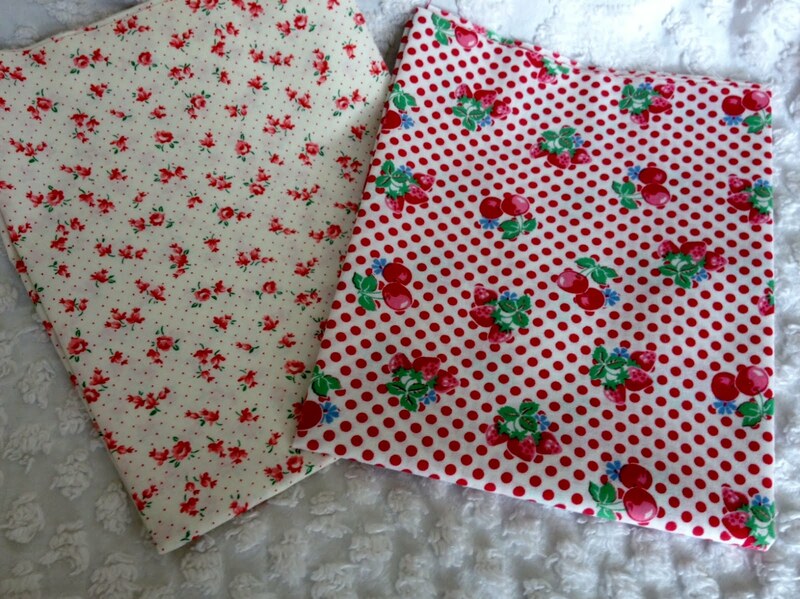 These two fabrics have a feedsack quality to them. I like the explosion of flowers in them. Oh gray, I'm so adoring you right now. These two are both gray backgrounds. The lighter one is just a hint of gray and the darker tulip is really wonderful. 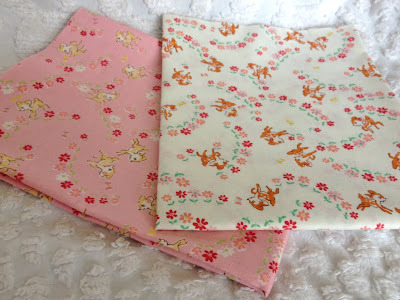 I really enjoy a baby deer on fabric. 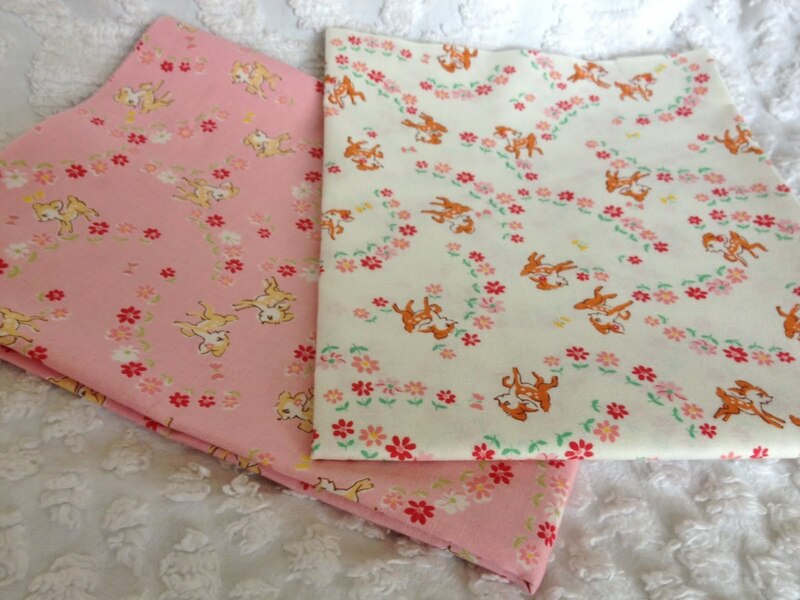 And these with the parade of daisies are just lovely. It is a great pile of 1/2 yard cuts. I am going to keep them out where I can be inspired by them. 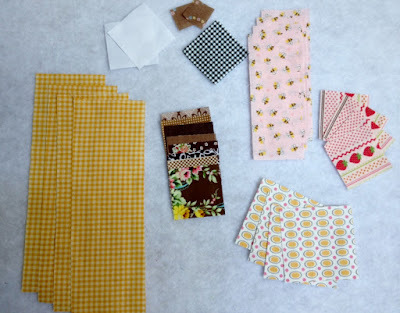 So....a couple weeks ago I was auditioning fabric for my Gypsy Kisses Quilt in this post. 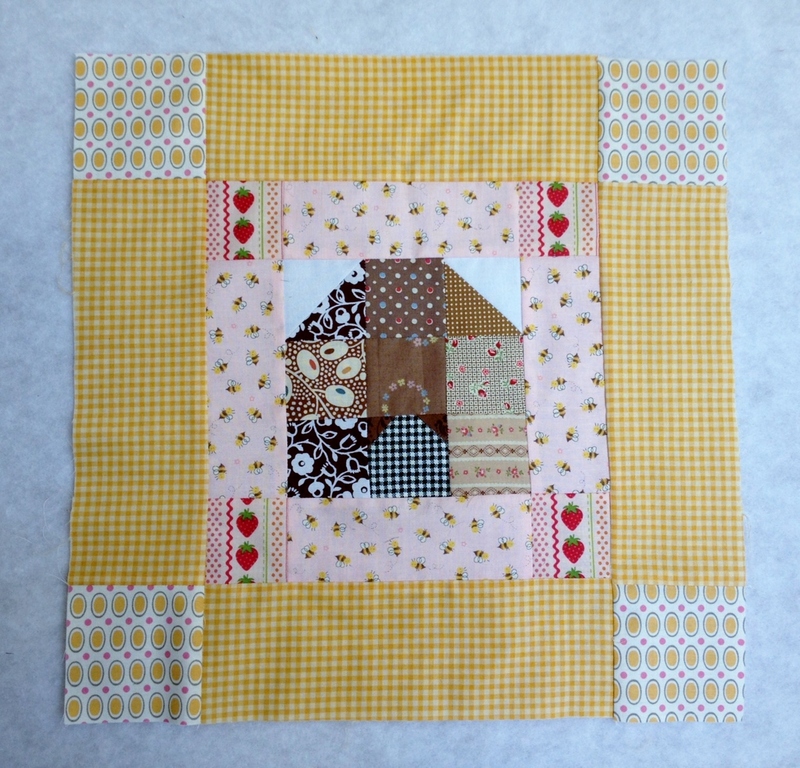 Thanks to everyone for helping me evaluate my fabric and consider what is important to me in this quilt. Hands down the green Denise Schmidt fabric was most popular in the comments. I love that fabric too. But I was still in a muddle. None of the fabrics seemed just right or rather they ALL seemed that they would work. However, Silly me. 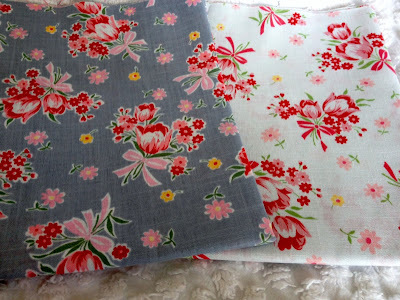 When I measured my fabrics, I didn't have enough yardage of any of them. I even had some sweet friends offer to augment my yardage and share with me to get enough of several of the auditioned fabrics. But I couldn't ask anyone to do that. So then there was even more puzzling over what to do. Re-reading the comments did help me in one big way. It helped me realize that I wanted to stay true to the original quilt, so I decided to stick with a blue floral. And because I didn't have enough yardage, I went with an entirely new piece of fabric. One of my weaknesses is reading pattern instructions. I have several different books/directions for pickle jar quilts that I have been looking at and trying to use for help. I really thought this middle background blue was going to be curved pieced. Nope. This Gypsy Kisses pattern appliques this section. I actually had to read the directions to get it right and it wasn't really that hard. Much easier than curved piecing for sure. This is the only section I have completed so far. We'll see how the rest go and if they come together in rows. Little Eliza is still in the NBICU. There is just no predictable path for her. She still has the feeding tube and is back on and off oxygen from day to day. But she is growing and turning into such a pretty, sweet baby. 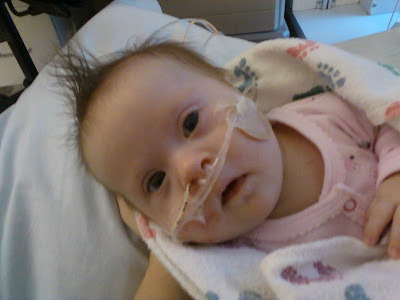 She's been having oxygen desaturations when she is fed or moved lately but in the past few days that has improved. She's being treated for reflux so her feedings are better right now as well. Thank you for all your prayers and sweet comments about her. They are so appreciated. I've gotten so I really don't decorate too much for holidays but I always have something going on in my entryway. 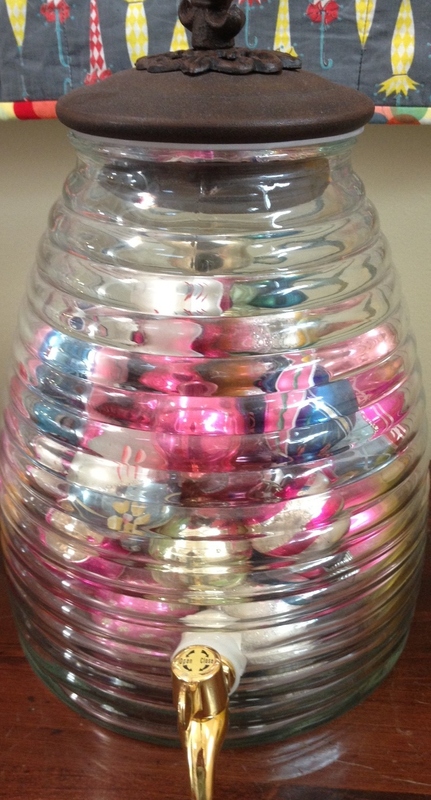 No matter the season or holiday we usually have candy in this jar. Everyone dips into this jar from time to time, even guests (like Mason's friends). This jar reminded me of my colored vintage Christmas balls hiding in the closet. 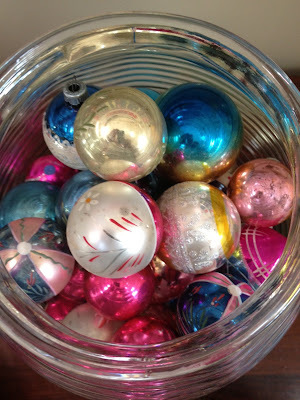 I decided that I loved these vintage balls too much to put them in a closet for 10 1/2 months out of the year. So I removed the red and green and found mostly pastelish colors. 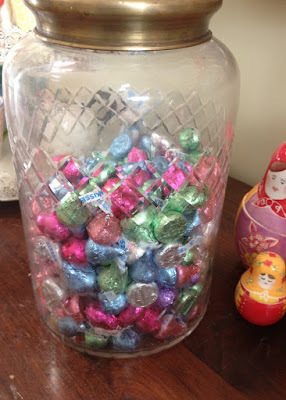 I put them in this jar and have them on my entryway side board. I may never put them away. I'm thinking of red, white and blue Christmas balls for summer. See how pretty they look. I feel like starting a movement to get those beautiful vintage glass balls out of every closet and into the decor of the home where they can be admired and enjoyed. I put a few things on my 3 tired plate set that remind me of spring or Easter. 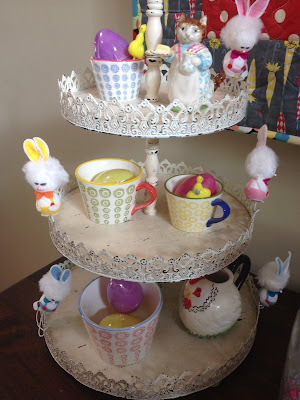 I had these funny little vintage Easter bunnies that I wired onto the rack to hop along the bunny trail. 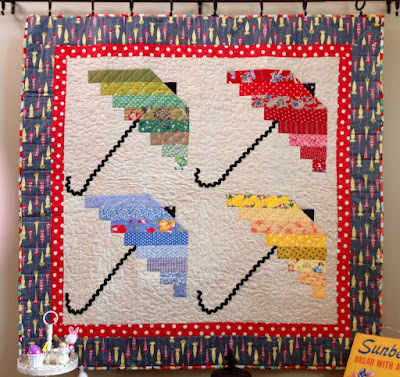 And since it is spring I put up my April Showers umbrella quilt. 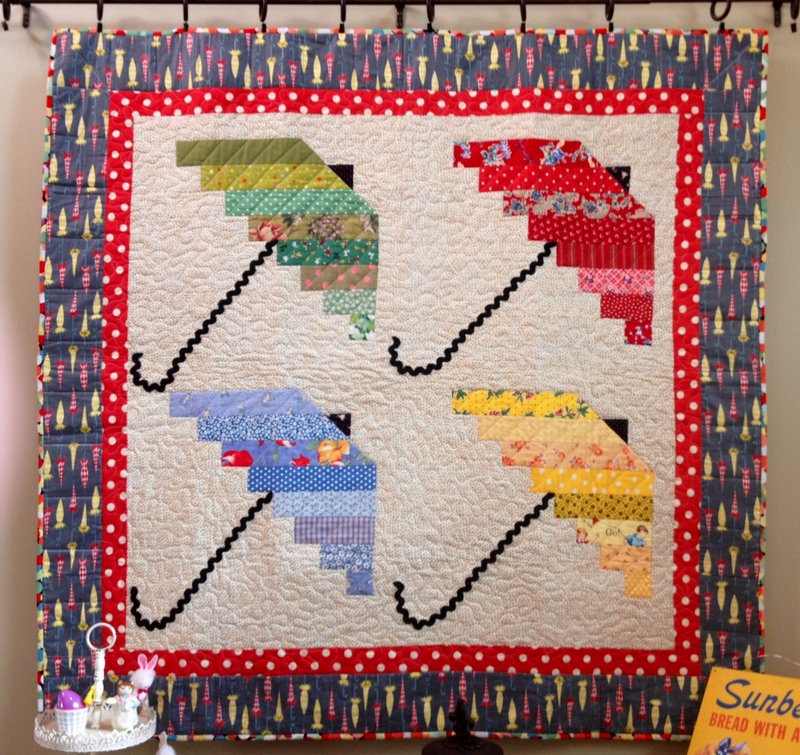 This is one of my all time classic quilts that is now probably 8-9 years old. It is an original pattern. I've never seen anything like it anywhere. I think it is so unique. Enough about me. Are you ready for Easter? 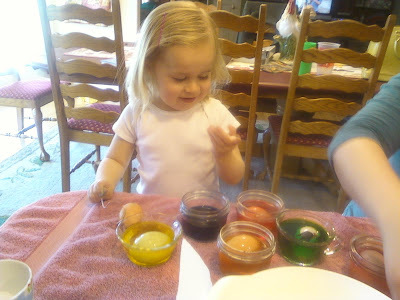 We plan coloring and hiding eggs with Allison this weekend. Fun.